The Claddagh is an old fishing village in the heart of Galway City which is popular with tourists from all around the world. They come to see the bay and the lovely view which surrounds the Claddagh. There are still many fishermen living in the area keeping the old traditions alive today. Claddagh fishermen were very superstitious and if they met a red haired woman on their way out to sea they would turn back as they felt it would bring them bad luck. Nimmo's Pier is a great place to go when you want to fish. If you visit the pier you will often meet people fishing there. Claddagh is famous worldwide for the Claddagh Ring which is designed here in Galway and is worn by people all over the world. 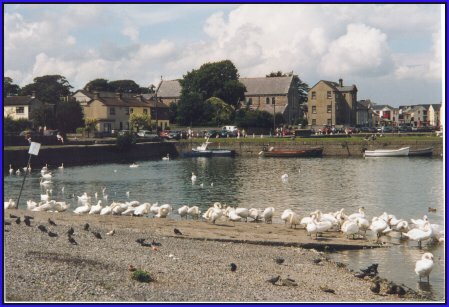 As well as been famous for our ring we also have one of the largest gatherings of swans in the country which swim around the mouth of the River Corrib in front of Claddagh Hall. The Claddagh is a great place to live.